Porur islocated on the Mount Poonamallee Road and surrounded by the Pallavaram Hills. It is known for its chemical industries, manufacturing plants,residential colonies and vegetable markets.Porur is one of the fast-developing suburbs of Chennai. It has a long history and was in existenceeven during the Pallava period. Porur is fast becoming a major IT hub with companies like Sutherland, iGate, Dell, IBM, MphasiS and Cognizant situated here and theiremployees prefer Porur as a destination. The average price for multi-storey apartments is approximately Rs5,500 per sq ft. Average price for an independent house is between Rs4,500 per sqft to Rs 5,500 per sq ft. Residential plots come at an average price ranging between Rs 3,000 per sqft to Rs6,000 per sq ft.
Porur has good road connectivity with Chennai city as well as other adjacent suburbs. The Mount Poonamallee Road connects Porur with Guindy and Poonamallee and Nungambakkam by Arcot Road. The Kundrathur road connects with the temple town of Kundrathur. 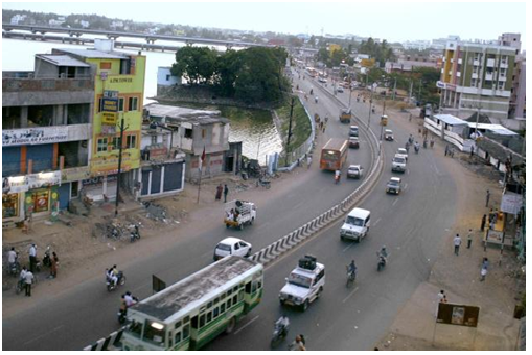 These three roads meet at Porur Junction – an important intersection for buses to Kancheepuram and Bangalore. Porur does not have any railway stations. Porur is also close to the NH 4 (the Chennai-Bangalore Highway). The Porur Flyover, built over Porur Lake, connects Maduravoyal with Tambaram near the Tambaram Bypass road. There are about 20 or more schools located in and around the locality. There are many hospitals also based in the locality. The Porur Lake and the Chembarambakkam Lake forms the RetteEri (two Lakes divided by road, one lake with water and the other occupied for living a long ago). The Porur Lake is the principal source of fresh water for the suburb and surrounding areas. Porur houses the Mono-Pulse Secondary Surveillance radar, one of the two radars in the city, which aids air-transport communication. The Sri Ramachandra College and Research Institute was opened here in 1985 and is a well-known premium educational institute. Porur is home to many temples, mosques and churches. The 1000-year-old RamanathaEaswarar temple is located here towards Kundarathur Road. It is one of the oldest Hindu temples in Chennai. Porur also has the ArulmiguBalaMurugan at EaswaranKoilStree and the Nagathamman Temple on Kundarthur Road. Porur is the headquarters of the Porur Evangelical Church. Looking to buy your new home or perhaps a good rental investment? RoofandFloor has great listings for projects in Porur. Your dream property is just a click away.